Atlas: Could this be the smartest fitness tracker yet? Just as we were starting to place bets on which the best fitness wearable of 2014 would be – I was going for Moov, FYI – along comes Atlas, a fitness tracking device that looks good and monitors your activity, but also analyses your form and performance levels to make your workouts more awesome. As Atlas’ CEO Peter Li points out on the device’s Indiegogo page many fitness tracking wearables currently on the market are “just glorified pedometers” that promise to provide you with a range of data, but actually don’t give those who take their fitness seriously much to work with. To look at Atlas is all very Transformers-y. 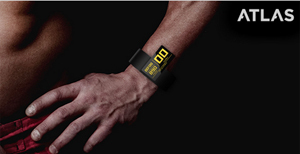 It’s a band-like wearable (just like the Nike+ FuelBand, FitBit Force and Jawbone UP) that has a range of on-board sensor to accurately measure the “type, speed and quality of your exercises”. It then converts all of this data into meaningful feedback to its dedicated app, ensuring the wearer is working at their most optimum level. Atlas has totally smashed its $125,000 Indiegogo funding goal five-fold with another five days still to go and although it’ll be entering a crowded wearable market, it certainly looks as if it’ll be giving the other serious, high-end trackers a run for their money. The early bird prototypes have unfortunately sold out, but you can get your hands on Atlas’ Get It Get Fit package for $169.